mwe3: We were discussing the amazing cover art for your new double CD set called Prayer To The Energy on your Facebook page. On the CD cover you have a utility pole bathed in purple light. Are you saying that 20th century electricity / energy is our new God so to speak and if were bad they power will go out and well suffer the consequences? How can we pray to something so unstable? Living in South Florida weve had numerous power outages from hurricane scares in recent years because of the vintage form of 20th century power. Hollan Holmes: Nature wields incredible power over which we have no control. It is why Nature commands my full respect. I think that I view God differently than most people. To me, God is simply energy in all its forms. Electricity, the incredible energy a hurricane, solar rays, all the ways that energy manifests itself. This is the divine. I'm also a believer in positive and negative energy and that love is the greatest manifestation of positive energy that I know. I've said it on numerous occasions that my music is how I pray, how I lament, how I meditate. I don't know from where my musical ideas come, but it is that wellspring of energy that I pray I never lose. You mentioned the fragility of electricity and that's important, because most of us take our modern conveniences for granted until we are without them and that is when we develop an acute awareness of the importance of energy in our lives. Not just electricity, but emotional energy that binds people together in times of uncertainty and spiritual energy that drives the human spirit and the will to survive and achieve great things. The album cover is based on the title of the first song, which is about the spiritual energy that drives so many humans to pursue greatness. I was looking at images of telephone poles when I ran across an image of a pole that had, at one time, two cross arms, but the top one was missing. As soon as I saw it, I realized that it resembled a crucifix. I don't mean to suggest that we should pray to electricity, but simply that we be mindful of whatever higher power transfers all the various forms of energy that make the existence of all life possible. It isn't lost on me that the vast majority of humans have lost their basic survival skills and the thin veneer of modern society is left incredibly vulnerable to the whims of mother nature. Hurricane Katrina showed us that with frightening clarity. and teach some basic skills, such as growing food and purifying water and putting aside these ridiculously petty social concerns. Technologically, there's no telling what we'll have come up with by then, but we will be lucky to have made it that far without bombing one another into the stone age, the likelihood of which grows daily now. 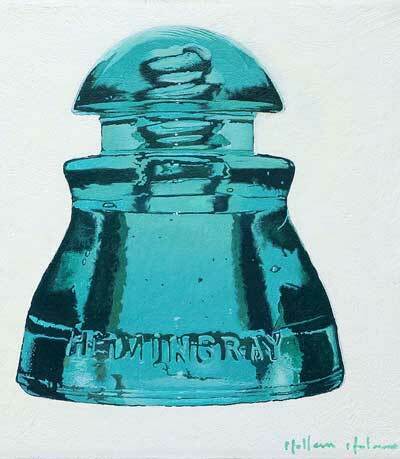 The painting of the Hemingray glass insulator ties into the cover image, which depicts several of them. It was also inspired by the song, Insulated, which strengthens my assertion that society is insulated from Mother Nature and that we give little thought to our vulnerability to the failure of the technologies upon which we now so heavily rely. Remove these technologies and we're in big trouble, because so few of us have any basic skills to cope with the absence of our fragile technological infrastructure. mwe3: Its being said that Prayer To The Energy is your best album yet, so what gave you the ideas to create the overall album as two separate albums and make it a double CD set? How are the two discs different in scope and concept as it applies to your music and specifically, your musical approach and frames of mind on Prayer To The Energy? 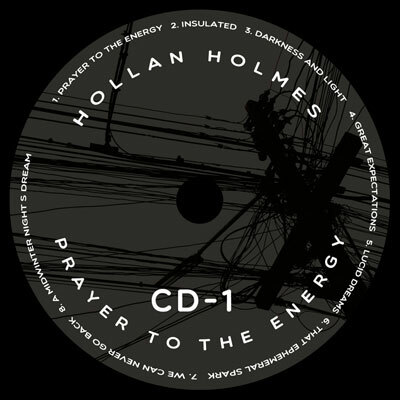 Hollan Holmes: Well, in the past, each of my releases have been a mix of the two primary styles of music that I pursue; The Berlin School of space music on the first half of the album and long-form, ambient, drone-based soundscapes on the second half. I decided to split them up on two CDs in order to give the listener the opportunity to pick which disc they preferred to enjoy at any given time, so that there would be no break in the energy that the two types of music each possess. You can listen to the first CD during your workout and listen to the second CD while you're sleeping or working or just relaxing. Of course, this direction necessitated an additional hour of music creation for the project, but it was something I wanted to do for a while and I'm really glad I did. With regard to my musical approach, this project was quite different than my past projects, in that this is the first project that I included the use of physical hardware synths and live recorded tracks in many of the songs. Because of this approach, the process of experimentation took on a new realm, because using a piano keyboard for composing music is radically different than just using a mouse. It's strange, because with each of my releases, I've felt a sense of trepidation regarding whether or not my music would be positively accepted and this one was no different. I don't release anything unless I like it, but it goes without saying that I always hope people will react favorably to my efforts. I've been overwhelmed with how well this release has been received. Some incredible compliments have been shared with me by fans and reviewers alike and I'm deeply honored and forever grateful for the kindness afforded to me by my listeners. mwe3: The liner notes say some of the tracks on Prayer To The Energy were written Chuck Van Zyls radio show called Stars End (starsend.org) How did you meet Chuck and how would you describe those track for Stars End radio? Are they redone or the radio show originals? 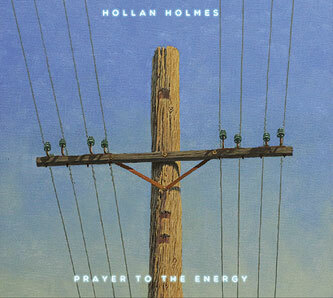 Hollan Holmes: I met Chuck through my friend, Richard Gurtler, who sent me a list of people to whom I could send my music for airplay consideration, reviews and distribution. Chuck was on that list and I've been sending him my albums ever since my first release and he has given me plenty of airtime and we've gained one another's respect over the years. 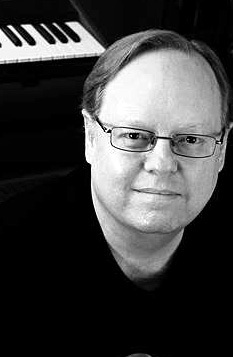 He does these annual special shows and commissions a select group of artists to create the music for each show. Chuck approached me in 2015 to do a twenty minute piece (A Midwinter Night's Dream) for his Winter Solstice special and I eagerly obliged. The exact music on my CD was the exact music that was composed for Chuck. Same story for his 2016 Halloween special and my song, Cerro Torre. Both were created solely for the purpose of his show. Because the two songs together comprise about 40 minutes of music and because I wanted to include both songs in the Prayer To The Energy project, that was another reason I split up the music into two CDs, so I could accommodate those two songs. mwe3: Was your approach on Prayer To The Energy different from your approach on both the Common Ground album and on your latest solo album Incandescent. Would you say that Prayer is darker or more translucent than Incandescent, at least musically and if so how does it also compare, at least compositionally with the Common Ground trio CD from 2015? Hollan Holmes: The approach was different from Common Ground in that it was not a group effort, but only me, which possesses a very different approach mentally. It differs from Incandescent in that I used a lot of hardware synths and live-recorded tracks, instead of mouse-drawn sequences driving soft-synths. I'd been wanting to record live tracks using my hardware synths for a long time and I decided it was time to just go for it. Compositionally, one could compare it to Common Ground in that on both albums, song ideas were born from experimenting for hundreds of hours with analog synths, exploring sound design and melodic structures that can only come about from playing a live instrument. It's a way of working that requires at least some level of proficiency in sound design and technical ability to play an instrument, which results in the confidence necessary to let go and explore music emotionally. mwe3: You list all the synths played and other gear in the Prayer To The Energy booklet. Were different synths or gear used on each of the CDs, or were some used simultaneously on different tracks? Can you give an example of what synths were used separately or together on some of the different tracks? It seems like theres been a renewed interest in vintage synths from the late 1960s and early 70s. 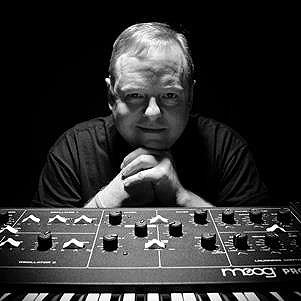 Hollan Holmes: The renewed interest in analog gear has exploded and it has resulted in a plethora of companies designing some really outstanding new synths. I avoided the last two decades of digital workstations with canned sounds and little in the way of sound designing power. It wasn't until a number of soft synths started being developed that emulated analog machines that I started getting interested in making music again. In the 2000s, we started seeing new completely analog instruments begin to hit the market and now we have access to tons of new analog and analog/digital hybrid synths at reasonable prices. Even the world of analog modular synthesis has resulted in ten times the number of options that were available in the 1960s and 70s. Because I love the Dave Smith Instruments new OB-6, I ended up using it on several songs on both CDs, including on Insulated, Great Expectations, Lucid Dreams, Cloud World and Cerro Torre. My Moog Prodigy was used at the beginning of Cerro Torre. The DSI Pro 2 was used on The Suspension Of Time and That Ephemeral Spark. The Prophet 12 got used only on Cloud World, as it was damaged in a studio accident early in production. The MS2000 was used on Insulated, but is pretty buried in the mix. Most of the hardware synths were recorded as live tracks played with the other midi sequenced tracks. It took me a while to get some of the recordings, because I'm really not that proficient of a musician. My strengths lie in composing. mwe3: You mentioned that your life changed recently when you lost your job as a graphic illustrator. How has that episode changed your outlook on things like your professional work standards, the outlook of the US economy and beyond? What else are you looking forward to this year as it unfolds? Seems like its a bit of a transition year for everyone but not without what it seems is a big fight. Hollan Holmes: I worked in the film and animation industry for about thirteen years as a texture artist/surfacing artist, before I was laid off in October of 2016. I had to make a decision quickly about whether or not to pursue a position within the film industry or leave the industry and become a full-time painter. I chose the latter, because it has always been my first love and I was becoming burned out with the film industry. It was becoming less and less about being an artist and more and more about being proficient with software, which is not only boring to me, but it simply wasn't my strength. It will take many years to become successful as a painter and there is no guarantee that I will even be able to make it in that arena, but it's a challenge that I embrace with enthusiasm and confidence, even during what is likely the worst time in recent economic history to become a professional artist. I'm enjoying life, though, more than I have in a long time. Put me in a big meadow in front of a mountain range, with an easel and brushes, instead of a desk and computer any day. Plein air painting beats pixel pushing every time. It certainly isn't looking good right now. Any number of global events could mean major changes for all of us, regardless of profession. At age 54, however, I'm going to live out my remaining years following my heart, instead of chasing the almighty Dollar. Experiences are worth far more than anything money can buy. Maybe I'll never be able to retire. Maybe I'll die poor. I'll die doing what I love, though, and that's enough for me. My hope is, of course, that I'll be able to build my music and art pursuits into a lucrative business. Being wealthy might be a fun ride, too!